I love children's hockey titles. Not only do these books introduce kids to the great sport of hockey, they also, and far more importantly, get kids hooked on reading. I consider it a great duty to pass on information about kid's hockey books because of this. Reviewing kids hockey books is not easy though, because different stories are better for some kids than others. I really encourage all parents to thoroughly screen each title before buying, as no one knows their kid better. I completely admit that I can often have trouble reviewing kids books because a) I'm not a kid and b) the kids that came into my life are teenagers, not little ones. There are no shortage of kid's titles to choose from in 2008, but I could never really suggest a book that would be perfect for every kid. I was recently introduced into a series of books called Brady Brady. The kid in me was instantly taken by the cartoonish illustrations and the brilliant use of colour. It is sure to catch anyone's eye. And better yet I was then wowed by the fun story telling complete with strong moral messages. Fun plus a good message is the necessary equation for any kid's title that I am going to endorse, and Brady Brady tops the list! 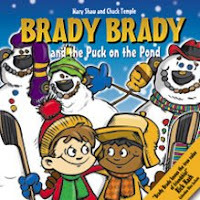 Aimed at boys and girls ages 4 through 8, Brady Brady is about a boy named Brady and his love of hockey. 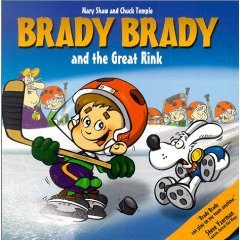 With his family, his friends, and his dog Hat Trick, Brady Brady goes on all sorts of adventures and learns great lessons on and off the ice. Each 32-page book makes reading a fun experience, and promotes common themes such as sportsmanship, teamwork and fair play. That is the biggest reason why school boards across Canada and the United States recognize the series and include it in libraries and curriculum. To top it all off all the books are extremely reasonably priced, with the jacket price at $7 Canadian! All titles are available at Amazon.ca and Chapters. 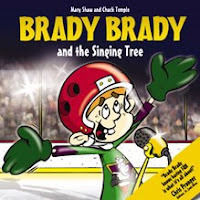 You can also order copies individually or in multiples at www.BradyBrady.com. Of course, the books are available in any of Indigo/Chapters stores, as well as independent book sellers and select sporting goods stores. The best selling Canadian children's series is written by Mary Shaw, who began writing when she was dismayed with the lack of engaging reading material for her son, Brady. Co-created with illustrator Chuck Temple, the two have created a growing Brady Brady empire, complete with their own publishing company, spinoff deals and, coming soon, animated media projects. Brady Brady has also been recognized by big league hockey. The Toronto Maple Leafs, Minnesota Wild and Columbus Blue Jackets have created customized Brady Brady programs to promote grassroots hockey in their communities. And several stars endorse the books, including Bobby Orr, Steve Yzerman, Scott Stevens, Haley Wickenheiser and Cassie Campbell. USA Hockey has also signed on with a licensing agreement. Here's a complete listing of Brady Brady books. You can't go wrong with any one title, but you will soon be hooked and looking for more. My personal favorite has to be The Great Rink. When Brady tries to build the greatest backyard rink ever, he finds out it’s harder than he thought. But his hard work is about to pay off in a way he never imagined! When Brady Brady and the Icehogs lose a big game to a rival team, they think it's the end of the world - until they realize what is really important on the ice. Brady's friend, Kev, learns that it's not only the goal scorers who are valuable members of a team. Just when Brady thought he had all of the makings for a fun game of shinny on his great rink, his friends are invited to play on an even greater rink! Friendships are tested - will the Icehogs stay together? Chester's loyalty to the Icehogs is questioned when he misses games and is overheard talking about joining the B Team. When the newest member of the Icehogs encounters some bad luck, Brady helps his teammate see that it will take more than "super-skating" to improve her game. When the Icehogs’ goalie goes missing before the big game, Brady Brady saves the day! Tes is a great player who loves hockey almost as much as Brady. So, when she is teased for being a girl, Brady and the other Icehogs back her up with a picture-perfect plan! Brady comes to the rescue when his friend Elwood almost quits hockey because of his dad. Brady's friends are coming to play shinny, and everything has to be perfect - more than perfect. If only he had something he could impress them with. Then it hits. The great idea the turns out to be a big mistake! When his friend has growing pains, Brady decides to help, and in the end everyone is a winner. All hockey titles are also available in French, courtesy of Scholastic Canada. If you're looking for a fun book with great moral lessons to help you pass on the joys of both sports and reading to your little boy or girl, look no further than the Brady Brady series.